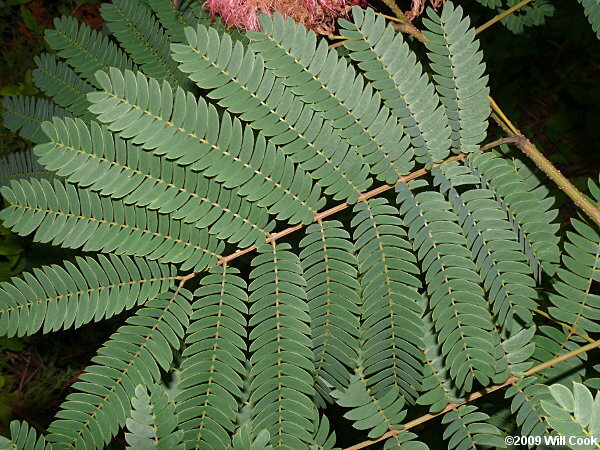 Officially called Silktree but more commonly known as Mimosa, this naturalized small ornamental tree from China is common in edge habitats, such as along roadsides, beside parking lots, and bordering powerlines. 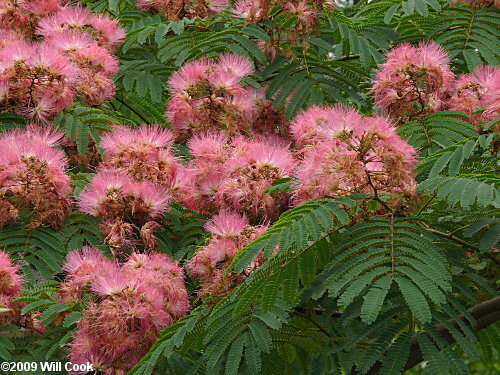 The twice-compound leaves with many fine leaflets and pink powderpuff flowers are very distinctive. 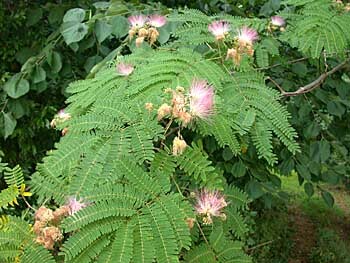 The genus Albizia is often misspelled Albizzia. 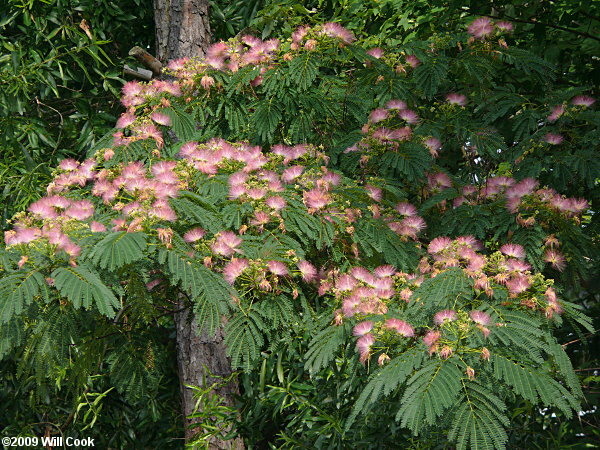 After a late leafing-out, the very fragrant flowers appear in June and continue through the summer, followed by flat bean-like pods. 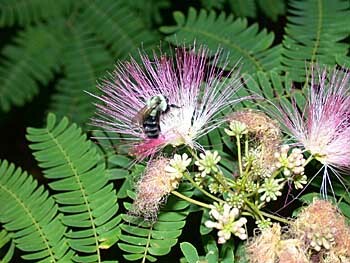 The flowers are favorites of insects, such as this bumblebee, and hummingbirds. 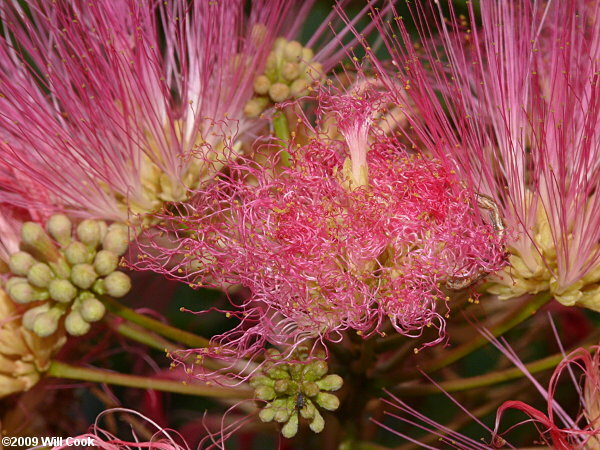 The only similar tree in North Carolina is Albizia kalkora, which is locally naturalized on the Duke University campus, Durham, NC. 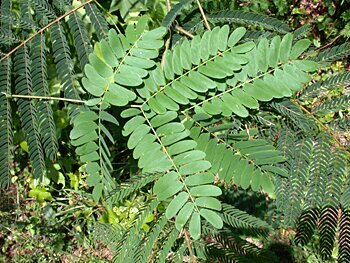 It has larger leaflets, with fewer pairs of branchlets on the rachis (~5 vs. ~10), and much rougher bark. 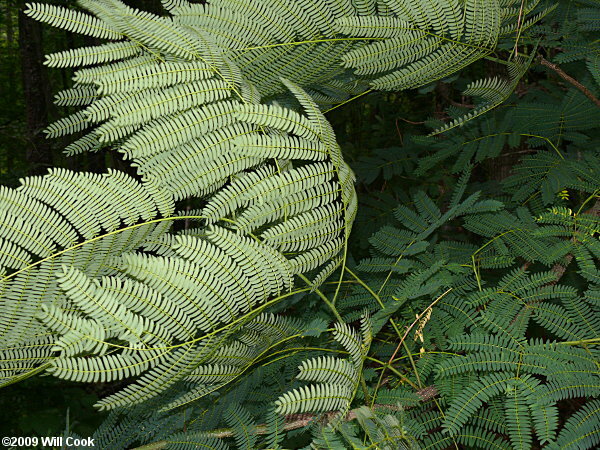 At left is a leaf comparison of A. kalkora (coarse yellow green leaflets on top) and A. julibrissin (the fine dark green leaflets). 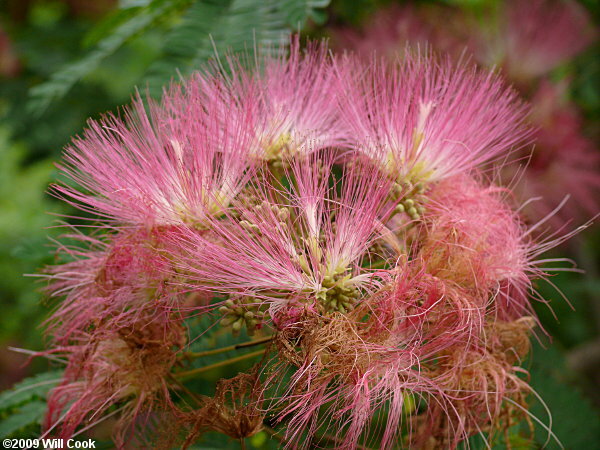 In 2006, Mel Turner discovered that apparent hybrids of Albizia julibrissin x kalkora are frequent along Towerview and Circuit Drives at Duke. 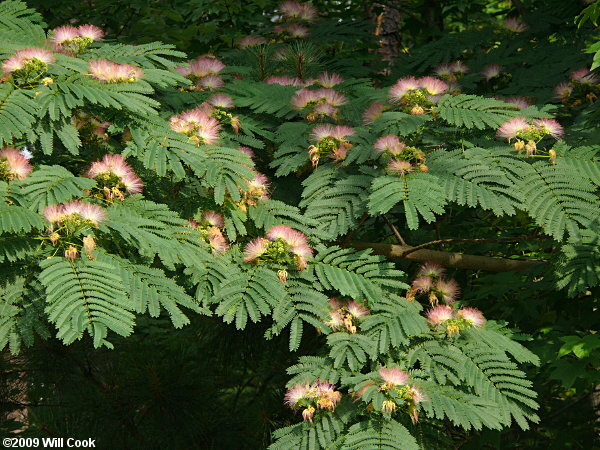 Indeed, the majority of trees in the area seem to be intermediate between the two species. 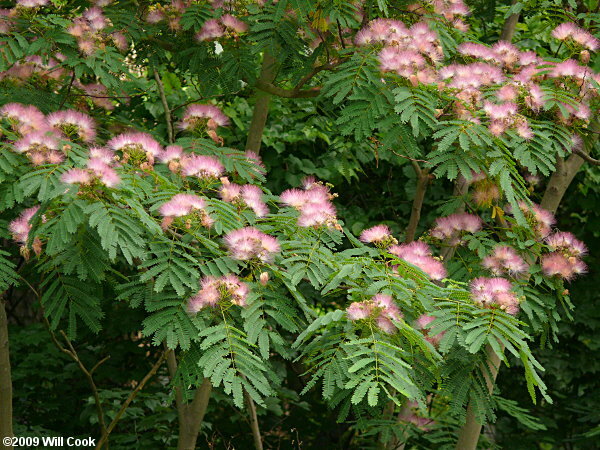 The trees some of the photos of this page are probable hybrids. 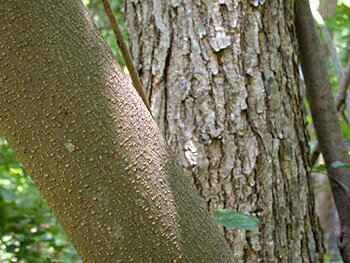 The bark is smooth, especially on young trees. 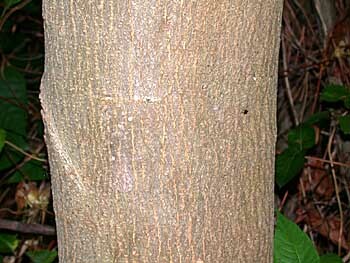 Comparison of the bark of Albizia julibrissin (in front) and A. kalkora. 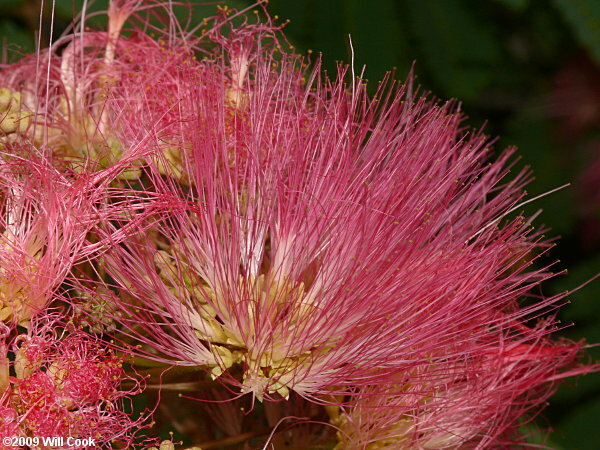 Hybrids between the two species are very common. 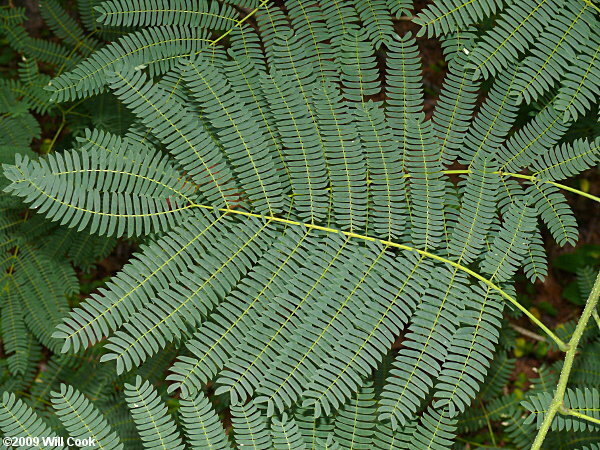 On the Duke University campus, most individuals appear to be hybrids, with intermediate numbers of leaflets on each leaf. Here are a few examples.